SharePoint Exchange Calendar Web Part helps import events from multiple SharePoint 2019, 2016, 2013, 2010 lists and Microsoft Exchange calendars, Google Calendar, and SalesForce Calendar into one SharePoint calendar. SharePoint Exchange Calendar Web Part supports integration of SharePoint 2019, 2016, 2013, 2010, or 2007 and Microsoft Exchange calendars, allowing SharePoint users to view, edit, and manage events from distinctive data sources (SharePoint lists, SalesForce calendars, Google Calendars, SQL tables, and Microsoft Exchange/Outlook Calendar) in a single SharePoint calendar. Try also our Office 365 Calendar. The Virto Exchange Calendar web part allows you to overlay SharePoint calendar, Exchange calendar, Google Calendar, SalesForce Calendar, SharePoint Lists, SQL Tables, or XML in a single calendar. If you use both Exchange calendar and SharePoint calendar for your business, and have event information in other data sources (see Virto SharePoint Calendar), you can add an Exchange Calendar, for example Exchange Edition of Virto SharePoint Calendar to collect all events in one view. 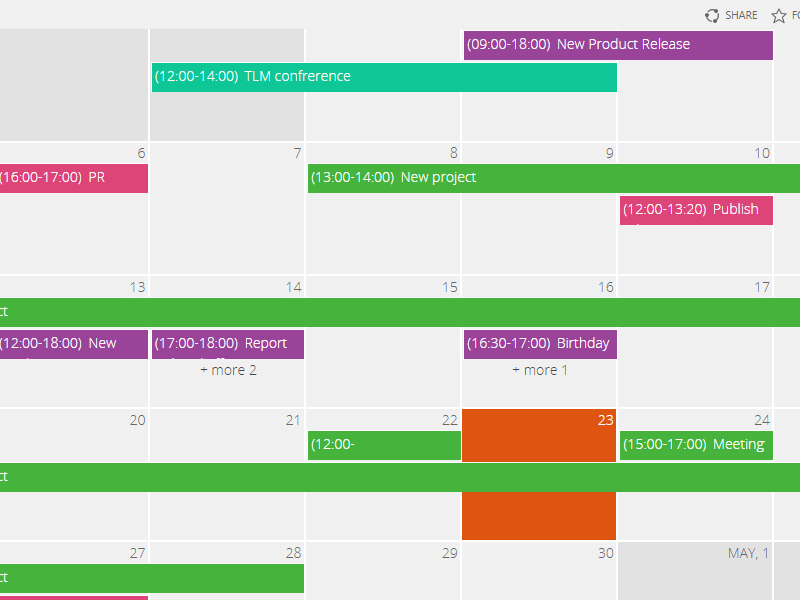 No more special synchronization and switching between one calendar to another to get full information about planned events and meetings. When you use Exchange calendar and SharePoint, you require a special solution to synchronize creating, editing, or deleting events processes in Exchange and SharePoint. This is made automatically when you have Virto Calendar Exchange Edition. Change your events on a SharePoint page in Virto SharePoint Calendar, and it will automatically update the same event changes in your Exchange Calendar. Use different colors for distinct calendars to differentiate events, according to data sources they belong to. 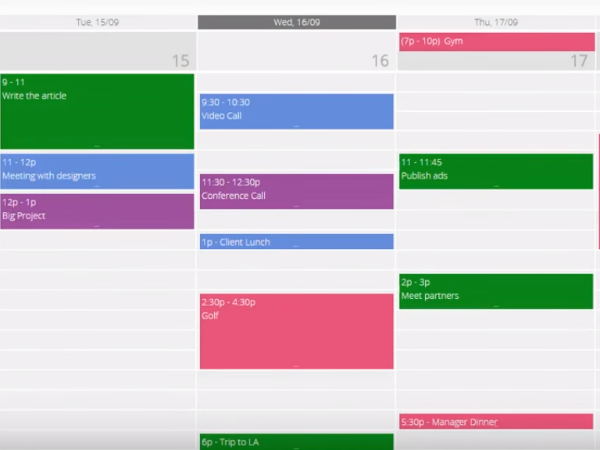 Highlight distinct calendars or event types with custom colors, and display your busy schedule in a convenient view. Tooltips for calendar events allow you to display description, timeframes, event participants or any other event fields. For displaying brief information for your events, you click on the event in SharePoint Calendar. You do not need to open SharePoint view form to know general information or details, so you can adjust the tooltip to display exactly what you would like to show. SharePoint Exchange Calendar is the most enhanced version of our powerful Virto SharePoint Calendar web part for calendaring, planning, and events management in SharePoint. SharePoint Exchange Calendar provides SharePoint users with extended features for SharePoint planning that are not available in the standard SharePoint Calendar Web Part. The Virto SharePoint Calendar substantially expands the functionality of the default Microsoft SharePoint calendar, and adds a wide range of features and capabilities. Integrating SharePoint and Exchange Server is highly demanded by many SharePoint users and developers. Virto SharePoint Calendar overlays Outlook Exchange Calendar and supports Integrating SharePoint and Exchange Server is highly demanded by many SharePoint users and developers. Virto SharePoint Calendar overlays Outlook Exchange Calendar and supports integration with other calendar types. The web part allows SharePoint users to edit and view, as well as manage events from distinctive data sources (SharePoint lists, SQL tables, Google calendar, Microsoft Exchange/Outlook Calendar, SalesForce calendars) in a single SharePoint Exchange Calendar Web Part. SharePoint Exchange Calendar is a part of Virto SharePoint Collaboration Suite and Virto ONE License. To overlay SharePoint and Exchange Online calendars in Office 365 try Calendar Add-in for Office 365. All Standard and Pro features supported Pro Exchange Edition includes all features of Standard and Pro Edition Calendars and some exclusive features below. Display any number of Exchange calendars from distinct users in SharePoint calendar Overlay Exchange calendar(s) with your SharePoint calendar(s) in one view. Create, edit, and delete Exchange calendar events on a SharePoint page with Virto Calendar web part. No need to run a special synchronization process. Just create, edit, or delete events in SharePoint, and the changes will be done to MS Exchange Calendar, as well. 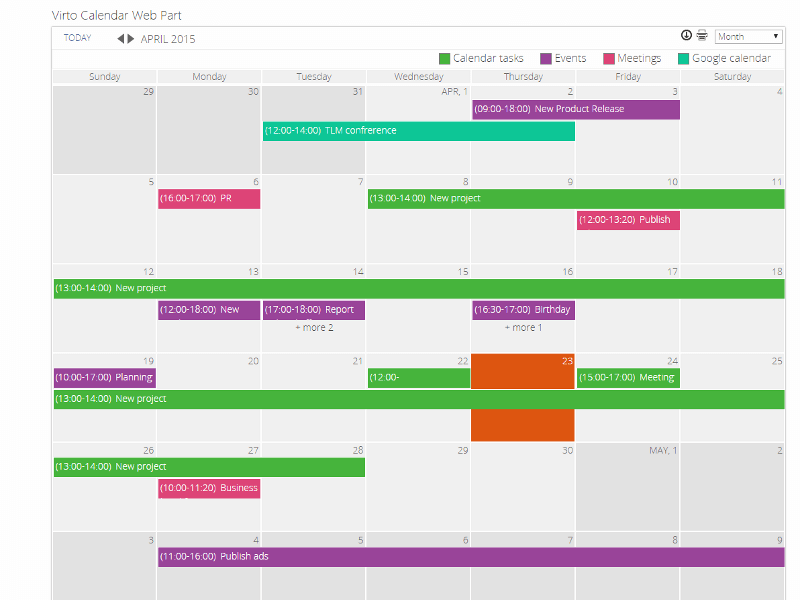 Color-code events from different Exchange calendars Use different colors for tasks, meetings and appointments to differentiate them visually in your SharePoint calendar. Calendar tooltip Set tooltips for calendar events that display description, timeframes, event participants or any other event fields. Exchange public folders supported The ability to display calendar events from Exchange public folders. Great solution to sync sharepoint calendar with exchange! Here you can add exchange calendar to sharepoint and use it for effective events management in SharePoint (calendaring, planning). I wanted to sync SharePoint calendar with exchange so I tried this web part. I'm absolutely satisfied with the result. Now I can display exchange calendar in SharePoint 2013 and manage my workload, events, etc more efficiently. It worked fine for me. Huge flexibility comes with fantastic support. 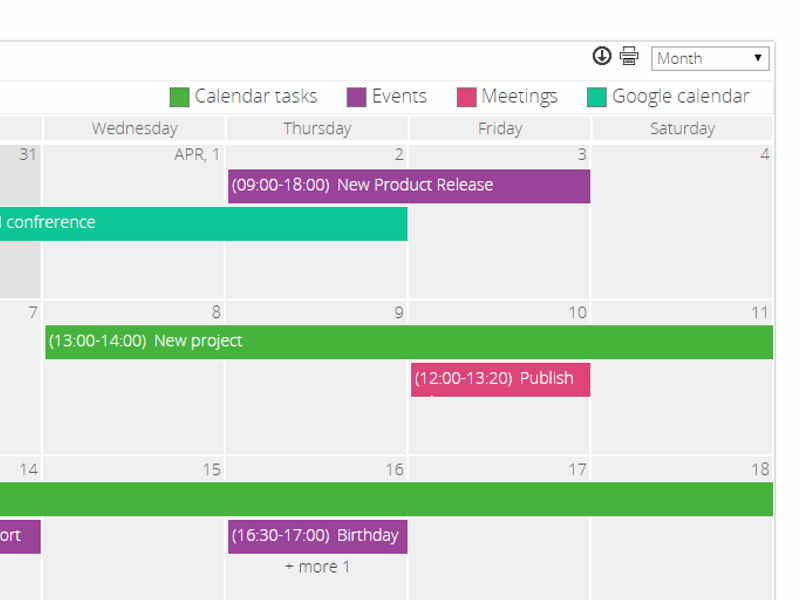 Great for SharePoint exchange calendar creation and editing. The best calendar web part out there! Customizable and has the ability to get data from Microsoft Exchange, Google Calendar, SharePoint lists and even SalesForce Calendar and in a single unified view! 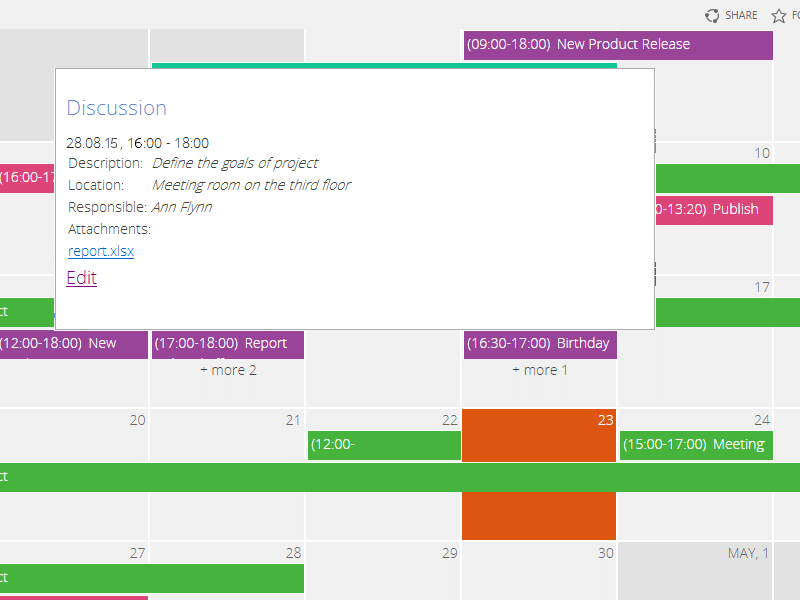 And not only that, I can also schedule meetings and events in Exchange directly from the SharePoint page! This SharePoint exchange calendar was very helpful for me. Good designed web part for keeping all events info in one place.